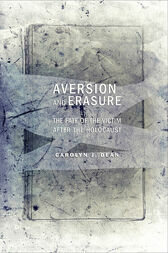 In Aversion and Erasure, Carolyn J. Dean offers a bold account of how the Holocaust's status as humanity's most terrible example of evil has shaped contemporary discourses about victims in the West. Popular and scholarly attention to the Holocaust has led some observers to conclude that a "surfeit of Jewish memory" is obscuring the suffering of other peoples. Dean explores the pervasive idea that suffering and trauma in the United States and Western Europe have become central to identity, with victims competing for recognition by displaying their collective wounds.She argues that this notion has never been examined systematically even though it now possesses the force of self-evidence. It developed in nascent form after World War II, when the near-annihilation of European Jewry began to transform patriotic mourning into a slogan of "Never Again": as the Holocaust demonstrated, all people might become victims because of their ethnicity, race, gender, or sexuality—because of who they are.The recent concept that suffering is central to identity and that Jewish suffering under Nazism is iconic of modern evil has dominated public discourse since the 1980s.Dean argues that we believe that the rational contestation of grievances in democratic societies is being replaced by the proclamation of injury and the desire to be a victim. Such dramatic and yet culturally powerful assertions, however, cast suspicion on victims and define their credibility in new ways that require analysis. Dean's latest book summons anyone concerned with human rights to recognize the impact of cultural ideals of "deserving" and "undeserving" victims on those who have suffered. "The pervasive discourse on suffering and identity in French and American debates about Jewish victims in the Holocaust is the starting point for Carolyn J. Dean's thoughtful, provocative, and original study of the victim in post-Holocaust theory and historiography."